The “What Pen Is This” Supplies Guide! I’m betting the answer is yes, if you’ve been trying to learn modern calligraphy, lettering or other related art. Now… you’re totally welcome to just go ahead and download it right away. 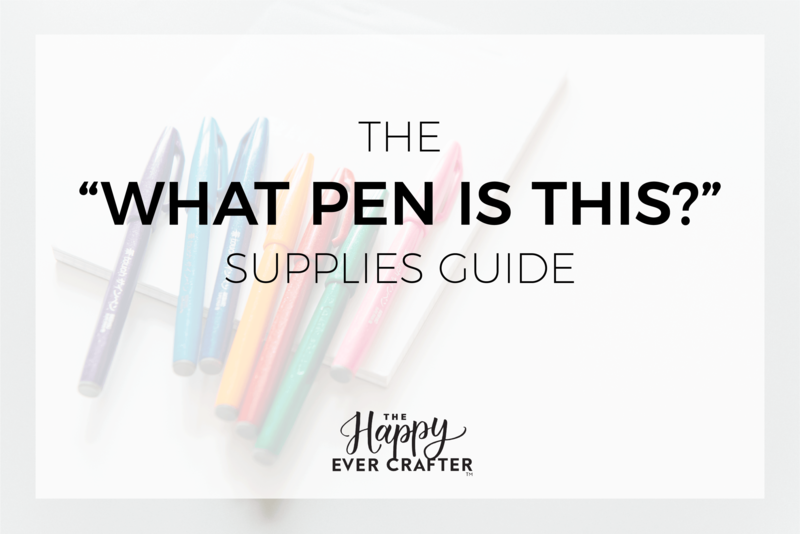 I’ve teamed up with some of the biggest and most awesome stationery & art supply companies out there to surprise one lucky pen-friend with a TON of the supplies inside this guide. Like… pretty much everything you need to get started with calligraphy & lettering. Interested? Read on to find out how to win. First, a huge thanks to the sponsors! First, you should know about the awesome companies I’ve teamed up with to bring you this prize. Tombow, Zebra, JetPens, DeSerres and Winsor & Newton have all generously donated supplies, so that our one lucky winner could walk away with one of the most comprehensive starter packs ever! Here’s what’s in the prize! …. insert *MIND BLOWN* emoji here, amirite?!?! This giveaway will have a *feeeew* steps more than your usual, since it’s such a huge prize. When you’re ready, make sure you’ve checked off all of the steps below. Tag 3 friends in the comments, telling them to enter too! And of course, download the “What Pen Is This” guide! Just enter your name/e-mail at the bottom of this page. Giveaway is open internationally! The draw for the winner will happen at 12pm EST on Monday, August 6th, and will be notified and announced via social media & e-mail. One entry per Instagram handle. Good luck! And I hope you enjoy the Supplies Guide! Thank you soo much Becca!! This sounds super exciting !! Perfect give away for my bujo! You’re such an amazing teacher! So generous. Thank you for making the guide and getting all these awesome sponsors together. You rock! Look at all the stuff 😱! I’m totally geeking out over this! yay! Fantastic offering! Hoping I’m lucky enough to win this for my August birthday! Eeek! So exciting! Good luck everyone! OMG I want them all!!!!! Thanks and super excited to get teh BIG list finally! What an awesome giveaway. Love your work that you do, especially for us newbies! So excited to be entered in this drawing!!!! Breathless after reading this post. Woooow!!! Quiero este paquete para mi!!! Cruzo los dedos! Wow what a give-away package. I’m already a fan and customer of most of these amazing companies and I’m so excited be introduced to the others! Thanks for doing this Becca! Amazing prize! thanks for chance to win! Fantastic giveaway, Thank you for your wonderful lettering guides. Oh wow! I look forward to the recommendations and am excited about the giveaway contest! Thanks Becca! OMG! Who wouldn’t want to win all the awesome writing materials??? I am crossing my fingers, arms, and legs! Let’s see if my luck will change.. hope to win, fingers crossed. Wow Becca, so amazing, hope I’m the lucky winner, this would be so amazing and I love your bouncing and lettering book so much definitely recommend it. Go get it now!!! What a great prize. Hope to win. Sponsors were generous that’s for sure. Entered the giveaway!! Looks AMAZING!!! And a big thanks for this pen guide!! Cheers! Love this give away. Best I’ve seen! Love this guide and hoping to win the giveaway! Thanks for the supply guide and a shot at this awesome giveaway! !